Nowadays, security solutions are mainly focused on providing security defences, instead of solving one of the main reasons for security problems that refers to an appropriate Information Systems (IS) design. In fact, requirements engineering often neglects enough attention to security concerns. In this paper it will be presented a case study of our proposal, called SREP (Security Requirements Engineering Process), which is a standard-centred process and a reuse-based approach which deals with the security requirements at the earlier stages of software development in a systematic and intuitive way by providing a security resources repository and by integrating the Common Criteria into the software development lifecycle. 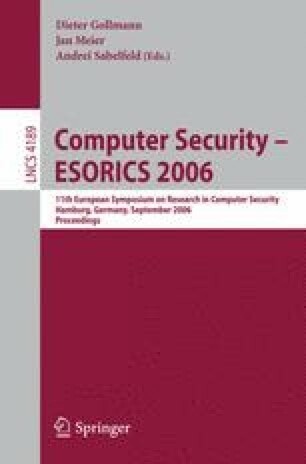 In brief, a case study is shown in this paper demonstrating how the security requirements for a security critical IS can be obtained in a guided and systematic way by applying SREP.